I have used Bing because it is convenient and because it provides rewards for XBox, however, whenever I would need information related to MSDN (that is *Microsoft* Software Developer Network) I would be forced into the arms of Google Search. 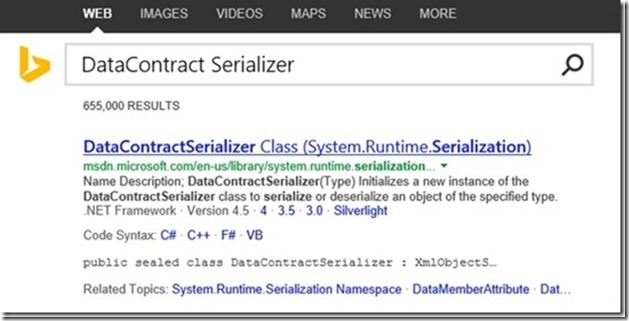 Today that changes Microsoft announced that API search would be integrated directly into Bing search. 1. Find the .Net versions supported. 2. View Code snippets explaining the syntax of this particular class. 3. Navigate to the appropriate version directly from the results page. 4. View syntax in the supported languages.